Jul 26, 2008 Sister Mary Peter, M.I.C.M. Since the expulsion from Heaven of Lucifer and the other fallen angels — an event antecedent to Adam’s creation — the Blessed Mother of God has been the razor by which the good are divided from the bad, the children of God from the children of the devil. When the Holy Rosary was given to us, it became at once a distinctive badge and powerful weapon of devotees of Our Lady. Some understanding of why it should be so can be drawn from the curse God placed on the Evil One, the Serpent, after Adam and Eve’s disobedience in the Garden of Eden: “I will put enmities between thee and the woman, and thy seed and her seed: she shall crush thy head, and thou shalt lie in wait for her heel” (Genesis 3:15). If the “enmities” promised by God are bound to produce conflict, a conflict destined to last until the end of time, there are but two sides to it. If we want to be on God’s side, we must be the seed of the Woman, our only alternative being to live as seed of the Old Serpent. But who is the Woman who will crush Satan’s head? Who else can it be but the Sinless One hailed as “full of grace” and “blessed among women” (Luke 1:28), Mary, the Virgin Mother of Jesus Christ, who is also our Spiritual Mother, given to us by her Son before He died on the Cross (John 19: 26-27)? There has always been, and always will be, enmity between the children of the devil and the children of Mary. The devil’s spawn will never cease to attack Mary’s spiritual children, and the latter will be wise always to defend themselves with the most powerful weapons possible, including the Our Father and Hail Mary.1 Composed as it is of Our Fathers and Hail Marys, if the Rosary is positively hated or despised by anyone, that person shows himself to be an enemy of God and therefore bound for Hell if he fails to correct his ways. Even to neglect the regular recitation of the Rosary is at least foolhardy, if not actually dangerous. This is why numerous canonized saints have seen devotion to the Rosary, or the lack of it, as revelatory of the state of a person’s interior life. How did we receive the Rosary? What is its history? It will be traced in the pages that follow. Common sense suggests that some simple device is desirable for counting prayers if they are many or recited in groupings of a certain number. So it is that adherents of many religions besides the One True Faith use devices, including sets of beads, to help them keep track of prayers or acts of worship. In Christianity, monks and hermits of the earliest years would gather pebbles and then toss them away, one by one, as they said each prayer or made each genuflection or Sign of the Cross. Later, strings of beads, berries, bone discs, pebbles or knots were employed. The very word “bead” reflects this. It is derived from the Old English word for prayer. When the Hail Mary came into more popular use, it and the Our Father were said the same number of times. We can readily understand why. As voiced by the Archangel Gabriel to the Blessed Virgin Mary when she was asked to become the Mother of God, it is a salutation. Even as reigning royalty is still saluted today by the repeated firing of cannons or honor is paid to individuals with cheers and applause, and more honor given with additional cheers or longer applause, so it was fitting to repeat the Hail Mary many times in order to honor the Queen of Heaven. That in fulfillment of her own prophecy that “all generations shall call me blessed” (Luke 1:48). Of this, then, did the Rosary in rudimentary form consist: common prayers, known and loved by the faithful, recited while being counted on beads. Some scholars and others may object to the history of the Rosary as related by Bl. Alan de la Roche. Believing that the modern trend to “de-mythologize” virtually every aspect of the Faith has led to an unhealthy spirit of skepticism, we choose to present what is reported by Bl. 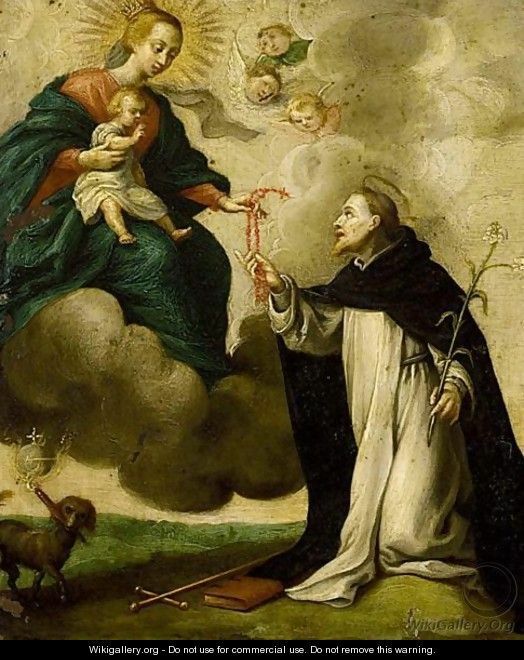 Alan — that St. Dominic received directly from Our Lady the Rosary as the faithful have known it ever since. We do so, first, because many popes, following the account given by Bl. Alan, have spoken of the Rosary coming to us from Our Lady, through St. Dominic. Further, although the earliest biographies of St. Dominic apparently say nothing about the origin of the Rosary as related by Bl. Alan, the latter attested under oath that the knowledge came to him through a mystical revelation. To doubt his account amounts to accusing a holy man of fabricating a story about Our Lady — i.e. of lying. To be sure, Catholics are not obliged as a matter of faith to believe everything ancient hagiographies tell us about the lives of the saints. However, the prevalent attitude of academics today — to doubt systematically whatever is related in a pious story — is not simply opposed to faith. It is unreasonable. St. Louis Marie spoke of this. “Everyone knows that there are three different kinds of faith by which we believe different stories,” he says. “To stories about holy subjects which are told by good authors and are not in the slightest degree contrary to reason, faith or morals (even though they may sometimes deal with happenings which are above the ordinary run of events) we pay the tribute of pious faith . “This is one of the devil’s traps: heretics of the past who denied Tradition have fallen into it and over-critical people of today are falling into it too without even realizing it. As for it being Our Lady who gave us the Rosary, through St. Dominic, when Innocent III was elected pope in 1198, Christendom was under threat. The new pope faced many problems, but the one that caused him the most concern was the rapidly spreading Albigensian heresy, introduced from the East and now well established in southern France. Preaching in the daytime and praying and doing penance for the sins of the wayward at night, St. Dominic labored for 10 years to bring the heretics back to the One True Faith. At first, he made little headway. It was obvious that the enormity of their sins were blinding many to the Truth. So it happened that at some point in 1214 he withdrew into a forest near Toulouse for nothing but to pray and do penance for three days and nights. He prayed especially hard to Our Lady to enlighten him as to what to do in order to bring the heretics to her Divine Son. Later centuries would be marked by further demonstrations and additional proofs. That terrible reproach moved Bl. Alan to resolve to preach the Rosary “unceasingly.”11 Such was his dedication that by the time of his death in 1475, he had enrolled over 100,000 persons in the Confraternity. Moreover, even skeptical historians will agree that, thanks to Bl. Alan, devotion to the Rosary was established once and for all by the end of the 15th century. He had received many revelations about the Rosary, revelations that enabled him to lead souls to Our Lady, and thereby to God. Our Lady showed the extent of her pleasure with him by calling him her new spouse, by placing a ring on his finger, a necklace of her own hair about his neck, and by giving him a beautiful Rosary. 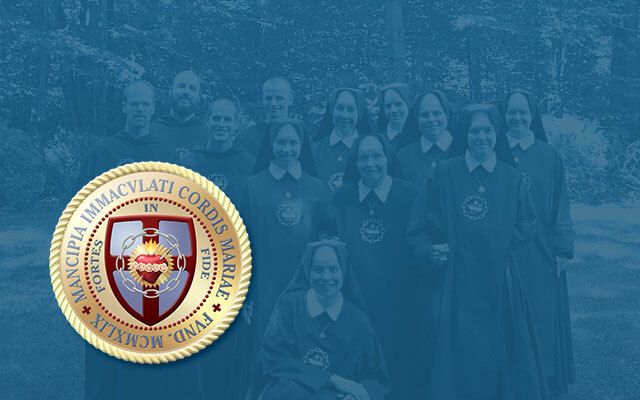 Such was the effect of faithful membership in the Confraternity, it came to be commonly said of someone living in sin or who was heard to blaspheme that “this man cannot possibly be a brother of St. Dominic.” How different today’s world would be if in a single country there were 100,000 souls who led lives of such Christian perfection! If the purpose of this article is to trace but some of its history, it is obvious that not many of the most notable stories about the Rosary can be told in so little space. To detail the everyday miracles of grace accomplished through the Rosary — miracles generally known only in Heaven, anyway — is still more impossible. No more than highlights of the most important Rosary miracles can here be offered. They must include something about the Rosary’s role in the outcome of the Battle of Lepanto, so pivotal was that event in the history of Christendom and the world. From their rise at the beginning of the 7th century, the Mohammedans sought to spread their false religion by means of the sword. The “Scourge of God,” as they were called, poured out of the Arabian Peninsula and within a matter of years subjugated the Holy Land, Persia, Iraq, and North Africa — all of the lands of the Middle East that were Christian, or nearly so. From Africa, they conquered Iberia. Spain would not finally rid herself of this alien occupation until 1492. Unfortunately, great as was that triumph in the West, the Mohammedans had won their most momentous victory in the East 39 years before. That was when the capital of the once mighty Byzantine Empire, Constantinople, fell to the forces of Sultan Mohammed II in 1453. With its fall, Europe was open to attack from the East. Europe was vulnerable. The rise of nationalism and internal strife, especially after the Protestant Revolt at the beginning of the 1500s, made her so. It was far from being a mere empty boast when the Sultan declared that he would top St. Peter’s in Rome with the Crescent and wrap the pope’s head in a turban. Rosaries were recited daily on the ships of the assembled Christian fleet; blasphemy, swearing and gambling were forbidden; and all the sailors and soldiers performed their religious duties. Throughout Europe the Catholic faithful joined in begging the assistance of her who is “terrible as an army set in battle array” (Canticle of Canticles 6:3). The enemies met off Lepanto in the Gulf of Corinth at dawn on October 7, 1571. The Turks sounded as if they were straight from Hell with their shrieks and wild yells. The Christians maintained a general, dignified silence that mirrored their determination. When the battle ended at about 5 o’clock in the afternoon, no more than 45 Turkish ships were left afloat or uncaptured out of a fleet of 274. The Christians, who had a smaller fleet to begin with, lost 12 galleys. In comparison to the 30,000 Turks killed or disabled and 8,000 taken prisoner, 7,500 Christians were killed or wounded. In addition, thousands of Christian galley slaves were freed from Turkish captivity. It would be days before news of the battle’s outcome reached Rome by ordinary means, but from a window in the Vatican St. Pius V was given to see this victory over a supposedly “undefeatable” foe when it occurred. From the beginning, Don Juan declared that the true victor at Lepanto was Our Lady. The Venetian Senate memorialized that “It was not generals nor battalions nor arms that brought us victory; but it was Our Lady of the Rosary.”12 In thanksgiving, St. Pius V made October 7 the Feast of Our Lady of Victories,13 and added the title “Help of Christians” to the Litany of Loreto. Europe had been saved, and the Turks finished forever as a sea power. Not only against the Turks has Our Lady been of vital help to warriors fighting under her banner. Looking to establish a Protestant regime in Catholic France, Calvinists of that country, usually called Huguenots in the English-speaking world, did not hesitate to go to war. These heretics were not the quiet, peace-loving people many historians (Protestant ones) have portrayed them as being. As violent as the Albigensians, they staged uprisings, perpetrated massacres, and burned cathedrals, churches, convents, monasteries and libraries, destroying irreplaceable treasures of every kind. When in 1627 King Louis the Just (Louis XIII) began the siege of La Rochelle on France’s Atlantic coast, it was the stronghold of the Huguenots. The king wrote his mother from the field to have public prayers said for victory. Accordingly, from May 20, 1628 until victory was attained on November 1, Feast of All Saints, the Rosary was recited every Saturday. The Litany of Loreto was also intoned with the reigning queen, the queen mother, court nobles, high prelates, religious and laypersons joining in a procession. The result? So complete was the victory, ending forever as it did the military threat posed by the Huguenots, the faculty of the University of Paris proclaimed it a miracle of the Most Holy Rosary. Turkish sea power had been vanquished at Lepanto, but on land the Mohammedans remained a threat to Europe for a long time. That was until a series of Christian victories that closely followed one another early in the 18th century. At that time the Turks had violated all the peace treaties to which they were party and were embarked on a campaign of violent slaughter. Europe was roused, and under the direction and encouragement of Pope Clement XI an army was raised. It marched on Peterwardein in Hungary. Victory in the battle there was won on August 5, 1716. A few days later, Temesvar, the last Turkish stronghold in Hungary, was taken. One year later, on August 1, 1717, the Serbian capital of Belgrade, occupied and defended by 150,000 Turks, surrendered to Prince Eugene of Austria after three weeks of siege. These glorious victories led to the peace treaty of Passarewitz, with the Turks being forced to accept the terms of the Christians. In thanksgiving to Our Lady, Pope Clement XI extended the Feast of the Most Holy Rosary to the Universal Church. Further, when the battle standards captured from the Turks were sent to Rome, the pope, accompanied by the Sacred College of Cardinals, placed them on the altar of the Blessed Virgin in the Basilica of Saint Mary Major. In the same year as the victory at Peterwardein, the great giant of a saint, St. Louis Marie Grignion de Montfort, died. His seemingly endless love for his Spiritual Mother had led him to preach the Rosary as a missionary in his own country, France. His preaching bore much fruit, but his success also provoked the hostility of many bishops. Why would a saint reconciling sinners, building shrines, and reviving the faith of entire towns and cities end by being hated? The answer is one word: Jansenism. Numerous members of the French hierarchy were polluted with it at that time. Something like Calvinism, this heresy reduced Christianity to a cold, rigid routine that ignored the love God feels for His sons and daughters. Devotions were condemned. Our Lady, the angels and saints were cast into obscurity. It was in answer to this heresy that Jesus Christ appeared to St. Margaret Mary Alacoque in 1675 to establish devotion to His Sacred Heart. Several bishops threw obstacles in the way of St. Louis’s apostolate. For this reason, it often seemed that his work was going nowhere, achieving nothing. Yet, he was able to reawaken the Faith among nobles, soldiers and peasants. One of his greatest successes was in the town of Montbernage in the Vendee region. When he arrived there in 1705 the people had sunk so low they resembled pagans in their way of life. At first, they greatly resented his coming. By the time he left, however, every person in the village was once again practicing the Faith and saying the Rosary daily. So well did he establish devotion to the Rosary among the people that “When, at the end of the century, the woes foretold by de Montfort fell on France, the Vendeans marched to battle in defense of the altar and the throne, with Rosaries around their necks or arms, or fastened to their belts; and, in groups, or in common, they recited the Rosary which Blessed Louis had taught their fathers to value and to love.”15 Except for some neighboring Bretons, the Vendeans were France’s only people to take up arms against the terrible, bloody, anti-authority, anti-Christian, anti-God French Revolution. The work of St. Louis de Montfort brings to mind that of another great missionary, St. Francis Xavier, Apostle to the Indies. Besides the time he spent in India, he labored among the Japanese for two years (1549-1551), converting thousands and establishing devotion to the Rosary. He never failed to say the Rosary every day, no matter how tired he was, and he wore the Rosary openly to honor Our Lady. “Frequently St. Francis Xavier was called to distant missions to attend the sick and administer the sacraments to the dying. As it was impossible for him to attend to so many at one time, he used to send Rosaries to the sick, advising them to pray and, if they could not, to wear the beads around their neck. He assured the sick that they would either improve altogether or feel better, till he could arrive, so that they should not die without the sacraments. This promise was always complied with; the patients using the Rosary as St. Francis Xavier recommended were always given time to live at least until the holy missionary arrived and administered the Last Sacraments.”16 This wonderful gift was to be the chief means whereby many Japanese Catholics were able to keep the Faith, without the aid of priests, for 250 years. By 1615, a mere 66 years after the Faith was first brought to the islands, there were 400,000 Catholics in Japan. It was then that Japan’s rulers turned against them. All missionaries were expelled or martyred. Thousands of Japanese faithful won the never-fading crown of martyrdom. Thereafter, since there were no priests, remaining Catholics had but two sacraments available to them: Baptism (which can be administered in time of emergency by anyone having the use of reason) and Holy Matrimony (which is administered by the couple themselves). In 1859, missionaries were finally allowed to return. One of the first to arrive was Pere Petitjean. He received a great consolation and surprise on March 17, 1865. That was the date several Japanese approached him with three questions. They asked them to determine whether he was a true Catholic priest and not a spy sent to trick them out of hiding.17 The first was whether he was married (they had learned from their fathers that Catholic priests do not marry). They then asked whether he was at peace with the pope. The last question: “Where is your Rosary?” When he produced the required article, he was told the incredible story of how Japanese Catholics had preserved their faith all those years. There were about 50,000 of them at the time. The Rosary can convert the most hardened sinners, defeat God’s enemies, preserve the Faith, and make us saints. Why is it so powerful? It is because it consists of prayers composed by God Himself, and is the memorial of all that Jesus Christ has done for us, filling our hearts with gratitude toward God and giving us the strength to avoid anything that could offend so good a Friend. Bartolo was raised in a devout Catholic home in Latiano, Italy. Unfortunately, he joined the Freemasons when a student at the University of Naples. He rose rapidly through their ranks, eventually being “ordained” a priest of Satan in the Masonic Lodge.18 Later, thanks to the help of a good friend who was also a Dominican priest, he broke with the diabolical society and set about making reparation for the evil he had done. One day he fell into despair and nearly committed suicide. The Devil had brought to his mind the thought that since the priesthood of Christ is forever, so might be the satanic priesthood. Fortunately, Bartolo remembered some words of his Dominican friend, quoting Our Lady: “One who propagates my Rosary shall be saved.” He resolved that whatever time remained to him on earth, he would spend it spreading this devotion. His first step was to establish the Rosary Confraternity among the poor with whom he worked. The local bishop advised him to build a church for the Confraternity, but observed that he would first need an image of Our Lady of the Rosary. The only picture Bartolo could obtain was an old, dirty and cracked painting. It was eventually restored, and in 1876 the cornerstone of the church was laid. In 1901, Pope St. Pius X elevated the shrine to the rank of a Pontifical Basilica. It became a place of pilgrimage, visited by over a million persons a year and with many miracles worked through the now famous image of Our Lady of Pompeii. The reason Our Blessed Mother appeared at Fatima was to tell us what we must do in order to have peace. World War I was raging at the time, and Pope Benedict XV, after all diplomacy had failed, begged the Queen of Peace to come to the aid of mankind. She appeared at Fatima for the first time 45 days after he made his petition. Our Lady then warned of a “diabolical disorientation” and loss of faith which would occur within the Church. If something like them may now be observed — at least by anyone who has eyes to see — it must be due to Our Lady’s requests not being heeded. World War II would certainly seem a direct result of disobedience to her commands, for she had prophesied that “if people do not cease offending God, a worse one [war] will break out in the reign of Pius XI. When you see a night illumined by an unknown light, know that this is the great sign given you by God that He is about to punish the world for its crimes, by means of war, famine, and persecutions of the Church and of the Holy Father.”21 This “unknown light” illumined the night sky of January 25, 1938. Forty-five days after the Great Sign, Germany’s annexation of Austria (the Anschluss ) took place, setting the stage for the outbreak of World War II the following year. Thus we have the answer for our times and the fulfillment, it seems, of the prophecy Our Lady made to St. Dominic so many centuries ago: “One day through the Rosary and the Scapular I will save the world.” For now she comes, not simply to save23 one sinner, or to convert a nation or win a war, but to tell us the solution to the problems of the entire world! When enough Catholics do as Our Lady has asked, the pope will have the grace to do as God has commanded, through the Most Holy Virgin Mary. Some persons think that the Rosary is not for our “enlightened age.” The Lady of the Rosary — that is how she introduced herself at Fatima — has declared otherwise. If we want to have peace, if we want to gain Heaven, if we want to help save souls, let us set about obeying our dear Mother, the Queen of the Most Holy Rosary! 1. It is also referred to as the Angelic Salutation or Ave Maria , of which the first half is found in Luke 1:28 and Luke 1:42. The second half was added at the Council of Ephesus in 431. 2. Little did our saint know that the skeptics of today would believe the Bible to be scarcely ever factual. 3. The Secret of the Rosary , pages 31-32. 4. The word “Psalter” means the Book of Psalms or a collection or Psalms for devotional purposes. As has already been explained, the people’s “Psalter” was the string of beads on which they said the Our Father or Hail Mary. The Angelic Psalter would obviously be the latter. 5. The Secret of the Rosary , by St. Louis Marie de Montfort, page 18, quoting De Dignitate Psalterii , by Bl. Alan de la Roche. 6. From the word “rose.” There have been many visions showing each Hail Mary as a beautiful rose issuing from the mouth of the person praying, and being woven into a crown for Jesus and Mary by the angels. The Rosary has also been called the Angelic Psalter and the Psalter of Jesus and Mary. 7. The Secret of the Rosary, pages 54-55. 8. Members promise to say the Rosary every day, or in some cases once a week. Many indulgences have been attached to the Confraternity by popes over the years and many saints have promoted it. It is still under the care of the Dominicans. Other Rosary organizations are: the Perpetual Rosary (dating back to the 17th century), in which each person says the Rosary at a specific time, so that it is continually being said; and the Living Rosary (founded by Ven. Pauline Jaricot in 1826), made up of many groups of 15 persons, each one reciting one decade of the Rosary every day. 9. The Secret of the Rosary , page 79. 10. Little Office of the Blessed Virgin Mary , for the office of Matins. 11. The Secret of the Rosary , page 23. 12. The Rosary Crusade , by a Dominican Father. 13. In 1573 Pope Gregory XIII moved this feast to the first Sunday in October, changing the name to the Feast of the Most Holy Rosary for all the churches with an altar dedicated to Our Lady of the Rosary. 14. The Secret of the Rosary , page 22. 15. Wisdom’s Fool, by Eddie Doherty, page 121. 16. My Catholic Faith , by Bishop Louis LaRavoire Morrow, page 383. 17. The government had sent spies, pretending to be priests, among the Christians. 18. Bartolo Longo left his personal testimony concerning Freemasonry in the form of a “museum” in the basement of the Basilica he built in Pompeii. It contains many artifacts of the history and ritual of the Masons, including many items which he had used as a satanist priest. For documentation on the satanic nature of Freemasonry, refer to Grand Orient Freemasonry Unmasked, by Msgr. Dillon, available from our bookstore (see page 35). 19. For details and documentation on the miracle of the sun at Fatima, the reader is referred to the book, The Whole Truth About Fatima, (Volume II, available from our bookstore) or the online article, “The Miracle of the Sun,” at http://www.fatima.org/library/sc01pg16.html . 20. Fatima in Lucia’s Own Words, page 162. 22. The Whole Truth About Fatima, The Third Secret, by Frere Michael de la Sainte Trinite, page 754. 23. The word may disturb some, but do not mothers “save” their children? Our Lady does not deny that Jesus Christ is the Savior, but she is the means He uses to effect our salvation. That is why at Fatima she said, “Only I can help you.” God has handed our case over to her special intercession. God does not condemn repetition , but vain repetition. Vain, according to Webster’s dictionary, means: “1: having no real value: IDLE, WORTHLESS 2: marked by futility or ineffectualness: UNSUCCESSFUL, USELESS 3: FOOLISH, SILLY 4: having or showing undue or excessive pride in one’s achievements: CONCEITED.” Obviously the Catholic Church does not allow or encourage anyone to pray in this manner. However, Protestants seem to think that all repetition is vain. Here is a list of proofs from the Bible, which prove that this is not so. Psalm 135 – a biblical prayer – repeats “for His mercy endureth for ever” at the end of every one of its 27 verses. The word “Amen” is used over and over in Holy Scripture, and is, as well as “Alleluia,” a regular part of any Protestant’s prayer. Yet you never hear them say that that is vain repetition! Also, the Psalms were the official prayers of the Jews, which they prayed regularly. Our Lord Himself would have repeated them over and over again. Rev. Dr. Leslie Rumble, M.S.C. gives this very good explanation: “If you take the principle behind your objection, and push it to its full conclusion, you could say the Our Father but once in your life. If you said it once each year, it would be repetition. How often may you say it? Once a month? Once a week? Once a day? If daily, what would be wrong with saying it hourly? If you have just concluded one Our Father, why may you not begin it again at once? Does it suddenly become an evil prayer?” (Radio Replies , First Volume, page 288.) If you are allowed to pray something only once, you’d better keep a dictionary with you and cross out the words as you use them! Given by Our Lady to Saint Dominic and Blessed Alan de la Roche. 3. The Rosary shall be a powerful armor against hell; it will destroy vice, decrease sin, and defeat heresies. 6. Whoever shall recite the Rosary devoutly, applying himself to the consideration of its mysteries shall never be conquered by misfortune. God will not chastise him in His justice, he shall not perish by an unprovided death; if he be just he shall remain in the grace of God, and become worthy of eternal life. Anti-Catholic Protestants sometimes claim that the Rosary is a syncretic blending of Christianity with non-Christian religions. It is true that many religions (Islam, Hinduism, Buddism) use similar strings of beads as counting devices for prayers. So what? The fact is that all religions have common elements: holy books, buildings or other places set aside for worship, liturgy, music, vocal prayers, meditation, art of some sort (with only extremely rare exception), preachers, and many many others. To label Catholicism “pagan” because Hindus and Buddhists have prayer beads is logically equivalent to saying that, because Jimmy Swaggart (one Protestant minister who made this silly claim against the Rosary) and Anton LeVay (Satanic priest) both use electronic amplification in their Church services, then Swaggart must be a Satanist.